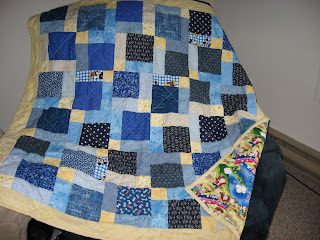 Farmer's Daughter Quilter: Quilts, etc.....mostly etc. 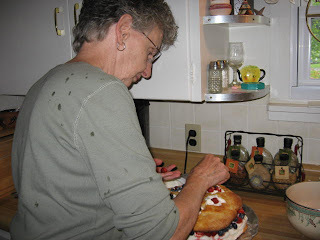 This is Cuzzin Elly Mae assemblying her strawberry-blueberry shortcake for a 4th of July picnic. Here's my Mixed Up Disappearing Nine Patch completed. The backing fabric is "Child's Play." The quilt is so easy it could be called Child's Play too. I made the nine patch blocks, cut them and them put on the wall randomly. Only item I was consistent with was putting 2 yellow blocks together. Now who do I give it to? Today my daughter Mickey & I have been emailing about details of our Thanksgiving Dinner. I forgot to put cranberry sauce on the menu. Family tradition is to forget the cranberry sauce until dinner is nearly over and to burn the rolls. We will have at least 7, maybe 8 or 10 that day. I remember family holiday dinners in the past. So much food, family together, laughter, inside jokes that families have. So many memories. It's fun to look at pictures of all of us in years past. Our hair, clothing and size are commented on. Last night I made Tortellini Soup for supper. It was so good. SweetOldBob ate 2 bowls but didn't want any for lunch. I had a bowl of it for lunch. It was even better than last night. Cuzzin Elly Mae told me how to make it. She claims not to enjoy cooking but does a great job of it.